Firstly, I will use Au+ instead of Ag+, so as to make a comparison with Pt2+ a little more direct. The electronic configurations are of course [Xe].4f14.5d10.6s0 and [Xe].4f14.5d8.6s0 respectively. I will also replace a simple ethene with cyclobutadiene, the intent here being that this cyclo-diene is a very much better π-donor due to its anti-aromatic character. It also now has the possibility of acting as a four or a two-electron donor. I started with M=Pt+ by adding another double bond to the structure of the ethene complex. Optimising this starting structure in fact moves the metal and the final geometry has C4v symmetry; in other words the metal is bound symmetrically to all four carbons. 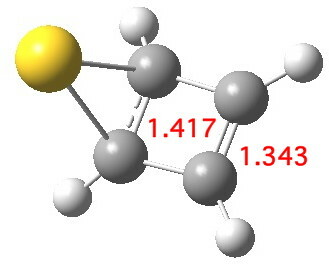 The four C-C lengths are all the same (1.46Å) and strongly suggest that four electrons from the cyclobutadiene are participating in bonding; the Pt2+ is clearly capable of accepting four electrons, two into 6s0 and two into 5d8. In the process, the cyclobutadiene looses its antiaromaticity. The molecular orbitals of this species are all lovely; I illustrate just one below. 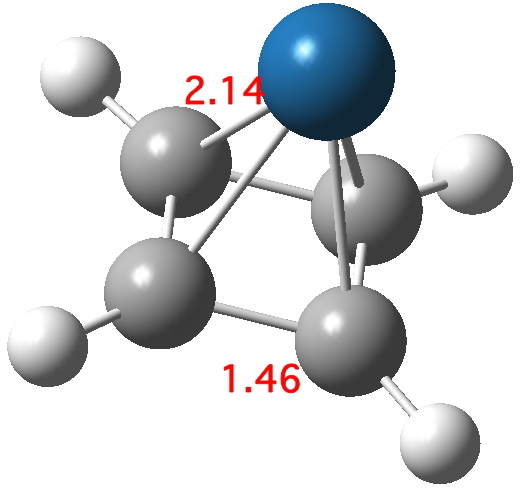 If the Pt in this C4v structure is mutated into Au+, the resulting optimised stationary point exhibits a negative force constant characteristic of a transition state. As the d-shell is already fully, the Au can only accept two electrons, and this is therefore a nice illustration of the “18-electron” rule in operation. 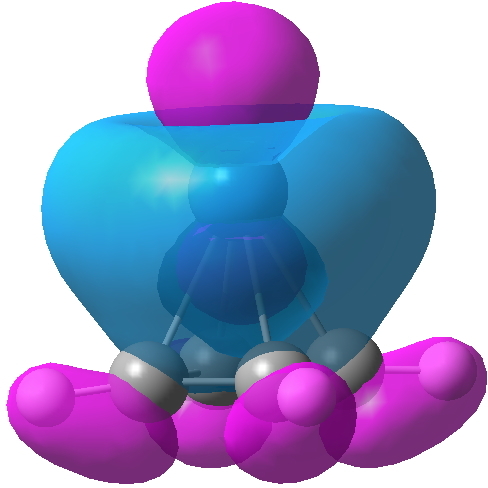 So, the Au+ complex must exist in at least one lower energy form. For example, one where the Au+ is coordinated to only one alkene is 94 kcal/mol lower in free energy. 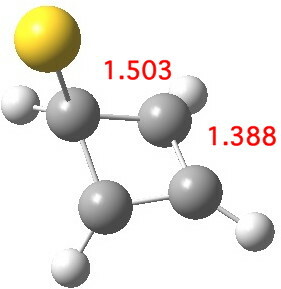 This form results in electrons from the coordinated alkene being donated into the 6s Au orbital, and this action reduces the anti-aromaticity of the cyclobutadiene ring. Another isomer also achieves this result, resulting in a further lowering in free energy of 11.0 kcal/mol The anti-aromaticity this time is eliminated by forming an allyl cation on the ring. I have described this mode in another post, commenting on the effect when a guanidinium cation interacts with cyclobutadiene. We have learnt that cyclobutadiene has many modes for eliminating 4n-electron antiaromaticity and other destabilising influences upon the ring. It can accept four electrons from a suitable acceptor (Pt2+), or two electrons from Au+ in two different ways. This entry was posted on Wednesday, May 15th, 2013 at 8:01 pm and is filed under Hypervalency, Interesting chemistry. You can follow any responses to this entry through the RSS 2.0 feed. You can leave a response, or trackback from your own site.